Close Storm Windows: Going around your house and making sure that every storm window is shut correctly. It doesn’t sounds like a lot, but doing so could potentially save you 10% in heating costs. Protect Your Pipes: Before the first freeze hits, make sure that you remove all your hoses from their spigot and close their shut off valves. After you have done that, open the outside spigots and let them drain completely. Fill in the Cracks: You can use a latex-based product that is the same color as your trim to close the space where the baseboard meets the floor and you won’t be able to see it. Doing this gives you twice the rewards: It helps to reduce drafts and it can cut your energy bills by as much as $30 per year. Check for Gaps: Look at your attic floors and basement ceilings and fill any holes, cracks, or voids that you see with insulating foam (you can find cans of it at most home centers). Just make sure when spraying the foam you only do a little at a time because it expands so much. This trick can potentially save you up to $200 per year in energy costs. Clean the Chimney: Find a certified chimney sweep in your area (csia.org), and have them check your fireplace and exhaust channels inside the chimney. If needed, they can clean them. This can cost you anywhere from $100 to $300, but it could help save you from a chimney fire or allow deadly carbon monoxide to be carried into your home from the soot and debris. Prepare Yard Equipment for the Off-Season: Buy a can of Sta-Bil, and pour it into the gas tank of all of your power equipment that you won’t be using this winter, and run the machine for a few minutes. This will help your equipment start up easier in the spring by preventing stale fuel from gumming up the works. (A bottle of Sta-Bil can last years, and only cost about $7). Install an Attic Hatch Cover: Although your attic floor is most likely insulated, your pull down ladder is not, this is basically a hole in that insulation. To fix this problem, you can purchase a stair-cover kit. This kit is a bit pricey (costing $130 at batticdoor.com), but you will likely recoup your cost in a single winter. Pad Window Air Conditioners: If you aren’t able to remove your window a/c, you can purchase a quilted cover to fit over the interior face of the unit. You can check out breezeblocker.net, a website that offers a large variety of sizes for around $30 to $40. Tune up your Furnace and Water Heater: Annually servicing on each can save you 5% in heating fuel and help to prolong the life of your equipment. Regular maintenance can also help make the systems more efficient. Insulate Basement Pipes: By wrapping the hot water pipes in your basement or crawl space with insulation, you can cut energy costs by as much as $15 per year! 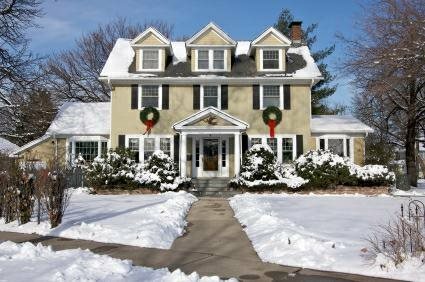 Clear Ice off your Eaves: Heavy snow can cause ice dams in your gutters, leading water to back up underneath the shingles and into your house. The average cost to repair this problem is $5,000. By hiring somebody that knows what they are doing, to chop out channels in the ice so that the run off can safely drain away could help prevent some major damage, and save you a ton of money. Prune before Snowstorm Season: Check your trees and make sure you prune away the unhealthy or damaged limbs. Heavy snowfall can bring down these limbs, and even entire trees. Tie up Evergreens: Find the evergreen shrubs in your yard without a thick central trunk and tie them up. You can do so by gathering neighboring stems together with flexible plastic tie such as a chain lock.